What is photosensitivity (sun sensitivity)? What is the difference between a photoallergic and a phototoxic reaction? What are the signs and symptoms of sun sensitivity (photosensitivity)? What are other examples drugs that cause phototoxicity? What foods and plants cause sun sensitivity (photosensitivity) reactions? What diseases or other health problems cause photosensitivity? How is sun sensitivity (photosensitivity) diagnosed? What is the treatment for a photosensitizing drug reaction? Is anyone taking these drugs at risk for developing sunburn? Are there any medical applications of sun sensitivity (photosensitivity)? Sun-sensitive or photosensitive drugs are drugs that cause a moderate to severe skin reaction that is similar to a bad sunburn when the exposed to the sun (UV rays), usually the forehead, nose, hands, arms, and lips. Many common medications cause this reaction in some people. Usually, the allergic reaction appears within 24 hours of sun exposure and resolves when the blisters from the rash peel and slough off. The photoallergic reactions may happen after several days of exposure to sun. Ultraviolet exposure causes the body's immune system to see a drug as an invader (antigen). The immune system initiates an allergic response and causes inflammation of the skin in the sun-exposed areas. Photoallergic reactions resemble eczema and are generally chronic. Photosensitivity (or sun sensitivity) is inflammation of the skin induced by the combination of sunlight and certain medications or substances. This causes redness of the skin and may look similar to sunburn. Both the photosensitizing medication or chemical and light source have to be present in order for a photosensitivity reaction to occur. Phototoxic drugs are much more common than photoallergic drugs. How high should the SPF be? Should it block UVA or UVB? Does it matter whether it is a gel, cream, or spray? Should it be water-resistant or waterproof? SPF stands for sun protection factor. The SPF numbers on a product can range from as low as 2 to as high as 60. These numbers refer to the product's ability to screen or block out the sun's burning rays. The SPF rating is calculated by comparing the amount of time needed to produce sunburnon protected skin to the amount of time needed to cause a sunburn on unprotected skin. The higher the SPF, the greater the sun protection. In phototoxic reactions, the drug may become activated by exposure to sunlight and cause damage to the skin. The skin's appearance resembles sunburn, and the process is generally acute (has a fast onset). Ultraviolet A (UVA) radiation is most commonly associated with phototoxicity, but ultraviolet B (UVB) and visible light may also contribute to this reaction. 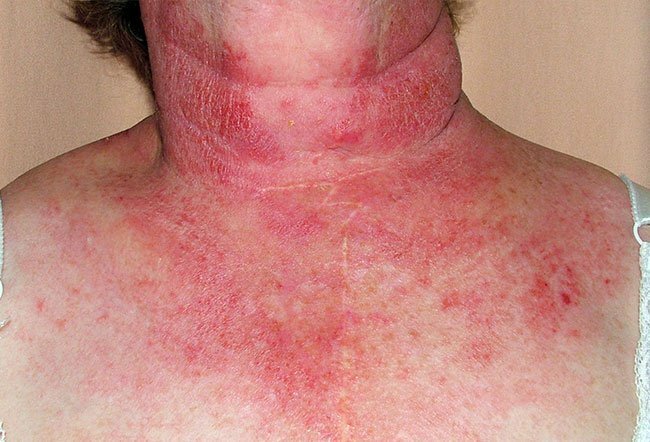 Rash from a phototoxic reaction is mainly confined to the sun-exposed area of the skin. A phototoxic reaction typically clears up once the drug is discontinued and has been cleared from the body, even after re-exposure to light. In photoallergic reactions, the ultraviolet exposure changes the structure of the drug so that is seen by the body's immune system as an invader (antigen). The immune system initiates an allergic response and cause inflammation of the skin in the sun-exposed areas. These usually resemble eczema and are generally chronic (long-lasting). Many drugs in this family are topical drugs. 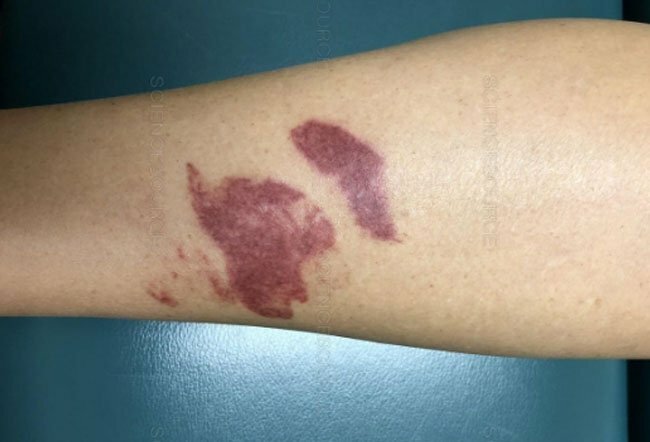 This type of photosensitivity may recur after sun exposure even after the drug has cleared from the system and can sometimes spread to areas of the skin unexposed to the sun. Individuals with phototoxic reactions may initially complain of a burning and stinging sensation. Redness typically occurs within 24 hours of the exposure to sun in the exposed areas of the body such as the forehead, nose, hands, arms, and lips. In severe cases, sun protected areas of skin may be also be involved. The range of skin damage may vary from mild redness to swelling to blister formation in more severe cases. 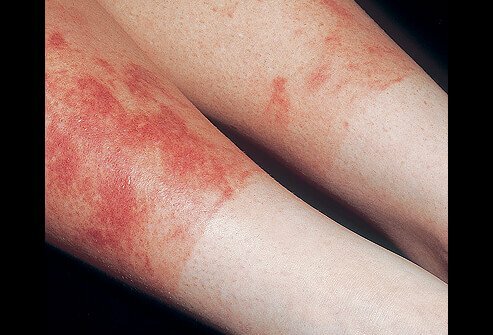 The rash from this photosensitivity reaction usually resolves with peeling and sloughing of (shedding) skin in the affected area within several days. Individuals with photoallergic reactions may initially complain of itching. This is then followed by redness and possibly swelling and eruption in the involved area. Because this is considered type of an allergic reaction, there may be no symptoms for many days when the drug is taken for the first time. Subsequent exposure to the drug and the sun may cause a more rapid response in 1-2 days. Hyperpigmentation (darkening) of the affected area of the skin may develop after the resolution of a phototoxicity reaction, but it is rare in a photoallergic reaction. In phototoxic reactions, high doses of the drug and long exposures to light may be required to cause the reaction. Can tanning beds cause a sun sensitive reaction? Only UVA and UVB rays reach earth. (UVC does not penetrate the earth's upper atmosphere.) Tanning lamps also produce UVA and/or UVB. These artificial rays affect the skin in the same way as do UVA and UVB from the sun. Nonsteroidal anti-inflammatory drugs (NSAIDs), for example, naproxen (Naprosyn, Naprelan, Anaprox, Aleve) and piroxicam (Feldene). Photodynamic therapy for skin cancer, for example, ALA or 5-aminolevulinic acid (Levulan), Methyl-5-aminolevulinic acid, verteporfin (Visudyne), and porfimer sodium (Photofrin). Para-aminobenzoic acid (PABA) - PABA has been phased out of sunscreen preparations because of the high rate of allergic reactions to this chemical. These are only some of the common sun-sensitizing drugs. Some medical conditions are known to cause sensitivity to sun exposure. Systemic lupus erythematosus (SLE) often causes a rash on the face which can be very sensitive to sunlight. 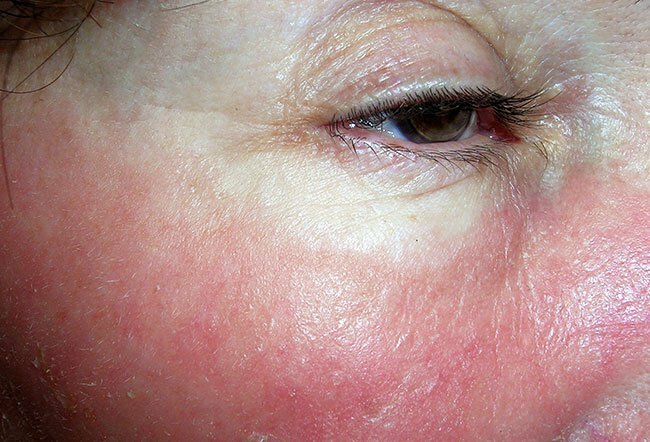 This rash is typically seen on the nose and cheeks, called a malar rash, and is considered one of the hallmarks of lupus. 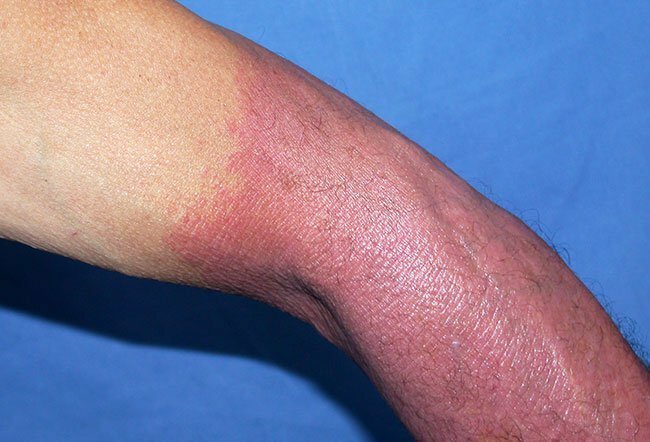 Porphyria is another medical condition that may cause photosensitivity reactions. 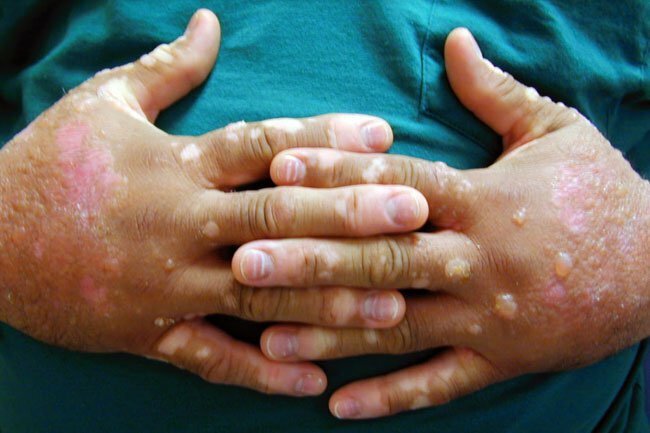 This is a hereditary condition with skin manifestation (cutaneous porphyria) causing rashes and blisters in reaction to exposure to sunlight. Vitiligo is a relatively common disorder that causes patches of white de-pigmented skin. These patches lack melanin and are extremely sensitive to UV rays. Xeroderma pigmentosum is a disorder that appears to result from an inherited hypersensitivity to the cancer-causing (carcinogenic) effects of ultraviolet light. Sunlight causes DNA damage that is normally repaired. Individuals with xeroderma pigmentosum have defective inability to repair the DNA after UV damage. Affected individuals are hundreds of times more vulnerable to developing skin cancer than other people. Their extreme skin photosensitivity predisposes them to pronounced skin damage and scarring and also to the early onset of skin cancer (basal cell and squamous cell carcinomas and malignant melanoma). Individuals with classic oculocutaneous albinism lack melanin in their skin and eyes - the term oculocutaneous" comes from "oculo" for eyes, and "cutaneous" for skin. Without the protection of this pigment, their white skin and pink eyes are both highly sensitive to UV and susceptible to the rays' damage. The diagnosis of sun sensitivity is mainly made by a thorough history, examination, and review of medications and duration of exposure to sun. It is important to ask when the medication was started and for how long the symptoms persisted. There are no diagnostic tests available, although a photo-patch test may be performed. This test is typically performed by a dermatologist (a doctor who specializes in diseases of the skin) by shining light onto different areas of the skin to see how long it will take for the light to cause redness. This test may be useful in evaluating photosensitivity to topical medications causing a photoallergic response. In cases of phototoxicity reactions, this test is generally not useful. Recognizing and discontinuing the photosensitizing drug is the most important step in treatment. In general, the usual sunburn prevention methods such as the use of sunscreens and avoidance of prolonged exposure to sun are important steps to take. Keeping the area of skin eruption moist and applying wet dressings may help relieve the symptoms. The reaction may last up to a few weeks. Topical steroid creams may be helpful in treating the redness, and antihistamines are generally helpful in minimizing the itching. In severe cases, a short course (10-14 days) of oral steroids, under the direction of a doctor, may be used. Not everyone taking any of these drugs will develop photosensitivity reactions. Certain individuals have more susceptibility to these medications than others. Photodynamic therapy utilizes the concept of sun or light sensitivity to treat some skin conditions including skin pre-cancers (actinic keratosis), skin cancers, and acne. Briefly, this treatment takes advantage of activating a photosensitizing drug (such as 5-aminolevulinic acid) by shining light directly onto it for a short time. The drug is first applied to the area of the skin where the cancer or pre-cancer is found. With light-induced activation of the drug, the abnormal cells (cancer or pre-cancer) are destroyed preferentially. New England Journal of Medicine 2004;350:1111-1117. Photosensitivity by Morrison, MD. Poh-Fitzpatrick, MB, MD. "Porphyria Cutanea Tarda." Medscape. Updated: Ma 08, 2017. Zhang, AY, MD. "Drug-Induced Photosensitivity." Medscape. Updated: Jun 14 June 2017. Take this quiz on how to get rid of ringworm. What is ringworm? How do you get ringworm? What does ringworm look like? Is ringworm contagious? 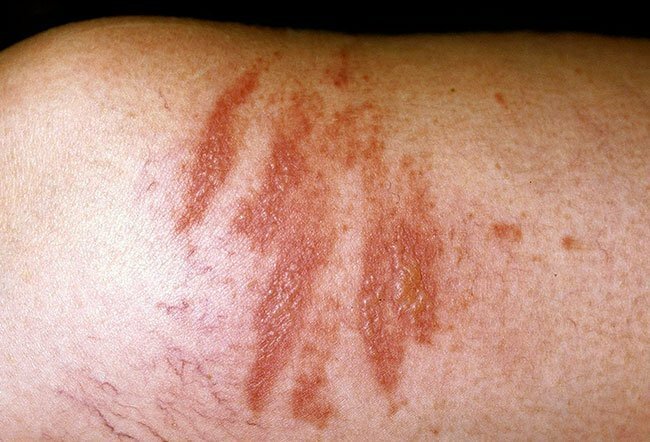 What are home remedies for ringworm? If you had a sun-sensitive reaction to a drug, what was the medication? What were your symptoms? Describe your reaction or symptoms to a sun-sensitive medication. When did symptoms appear? What types of treatment, including other medications, did you receive after experiencing a sun-sensitive drug reaction? Do certain vegetables, fruits, or plants cause you to have a photosensitivity reaction? Please share your experience. Freckles are flat circular spots on the skin that may be red, yellow, tan, light brown, brown, or black in color. Lentigo is the term used to describe certain types of darker freckles. Ephelis typically appear during the sunny months. Freckles can be prevented with sunscreens, the use of wide-brimmed hats, sun-protective clothing, avoiding peak sun hours, and seeking shade and staying indoors. Heat rash is a skin irritation caused by excessive sweating. It can occur at any age and it appears as a rash that itches or feels prickly, and looks like a red cluster of pimples or small blisters. Heat rash remedies include OTC creams and sprays. Usually heat rash resolves when the skin is cooled sufficiently. Medical treatment may be necessary if the sweat glands become infected. There are many natural and home remedies that are thought to relieve the symptoms ofa sunburn. Check out our top 30 tips to cool that sunburn, for example drink lots of water, juice, or sports drinks; apply a cool compress containing Burow's solution; coconut oil can be used as a moisturizer after sunburn pain has stopped; apply topical over-the-counter (OTC) 1% hydrocortisone cream; and take OTC pain relievers like NSAIDs (nonsteroidal anti-inflammatory drugs) such as ibuprofen (Advil, Motrin) or naproxen (Aleve). What do you know about the Sun and the damage it can cause to our skin. Take the Sun Safety Quiz and learn how to protect yourself during fun in the sun. Your skin type affects how easily you become sunburned. See a picture of Sunburn (Second-Degree) and learn more about the health topic. This Lupus Quiz covers causes, signs, symptoms, facts, and treatments for this inflammatory autoimmune disease. Vitiligo is a condition in which the skin turns white due to the loss of pigment from the melanocytes, cells that produce the pigment melanin that gives the skin color.